China’s buildup in the South China Sea is pushing the region closer to a possible military standoff over disputed territory, foreign policy experts tell FoxNews.com. The U.S. and its allies are raising concerns over Chinese land reclamation projects – essentially building manmade islands in the middle of the sea that many consider is a way for Beijing to expand its influence. “This should be of enormous concern — $5.3 trillion in trade transits through the South China Sea; this is one of the major arteries for world trade … China’s actions are clearly an attempt to establish dominance over this vital set of waterways,” said Dean Cheng, a senior research fellow with the Heritage Foundation. Six countries — China, Brunei, Malaysia, the Philippines, Taiwan and Vietnam — have all long maintained overlapping claims to waters and land in the South China Sea. Yet Beijing has claimed the largest portion, with officials saying they have the right to control roughly 90 percent of that region. 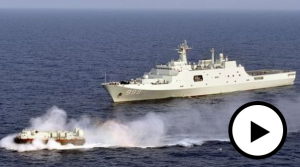 “As the Chinese go forward with this, they are making the claim that this is our territory and the waters surrounding within about 12 nautical miles are our territorial waters,” said Chris Griffin, executive director of the Foreign Policy Initiative. U.S. officials have monitoring China’s movements, but there is no official position on the overlapping territorial claims by China and five other nations. During a Senate panel Wednesday, David B. Shear, assistant secretary of defense for Asian and Pacific security affairs, emphasized America’s commitment to freedom of navigation in the area. Even with added U.S. pressure, China is pushing ahead with its military buildup. “We know at least one, possibly two, of these islands; they are preparing to build airstrips … they look like they are being prepared to allow them to base fighter aircraft or military helicopters out there,” said Cheng. There is some indication Washington and Beijing could be moving closer to a military standoff.